« Does Google already tell us how Greece will vote? We are now in a new lunar green period. The lunar cycle has maintained its perfect record so far in 2015. If it is to keep going for another period then stocks need to rally for some reason or other. 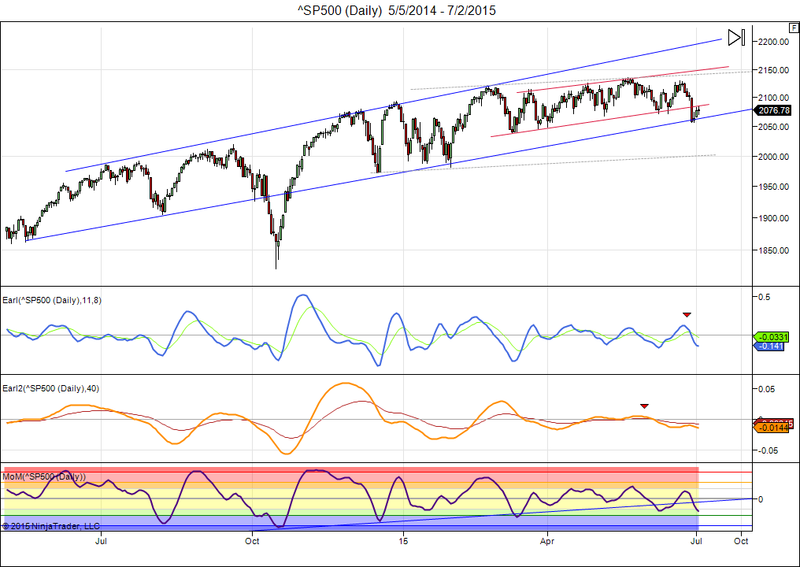 The S&P has fallen back to a long term support trend line. My technical indicators are all in bottom territory, but not turning up yet. So, there is potential for some rally to start in the next week. News from Greece can still swing the market either way, but I don’t think some kind of resolution can be postponed much longer. And any kind of “solution” may trigger a rally. This entry was posted on July 6, 2015 at 9:27 am	and is filed under Financial Astrology, Market Commentary. Tagged: lunar cycle, S&P 500. You can follow any responses to this entry through the RSS 2.0 feed. You can leave a response, or trackback from your own site.